Artist Katie Paterson has launched new artwork called First There Is A Mountain which allows the public to recreate five famous summits. The five are Mount Kilimanjaro (Africa), Mount Shasta (USA), Mount Fuji (Asia), Stromboli (Europe) and Uluru (Australia). 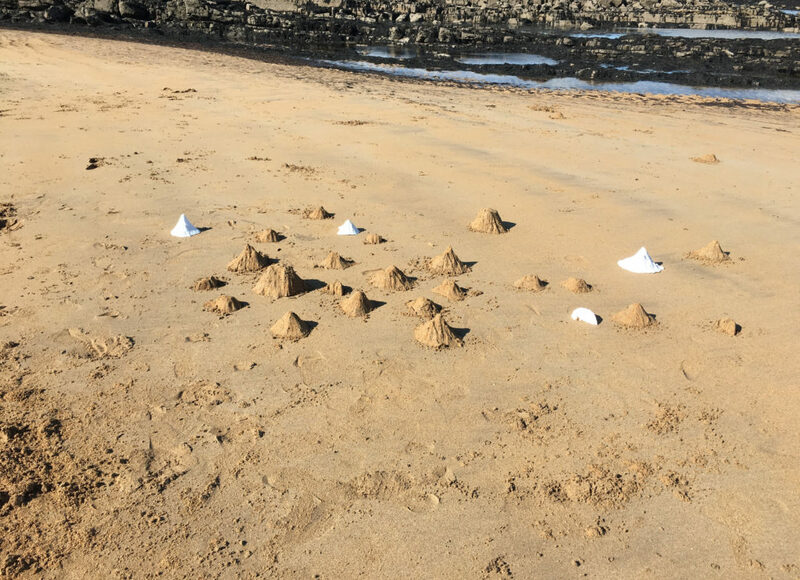 The coastal artwork will visit 25 venues all across the UK including Calgary Beach on the Isle of Mull on July 28; An Lanntair, Stornoway, Isle of Lewis (Coll Beach), July 7; Taigh Chearsabhagh Museum and Arts Centre, North Uist (Baile Sear Beach), July 14; Atlas Arts, Isle of Skye (Glenbrittle Beach), July 21. The sculptures will be made out of sand using scale models of each mountain. The aim of the project is to raise public awareness of the diversity and beauty of the mountains. There is also an educational side as the sculptures will be met by tidal waves as an example of the world’s natural geography against various tidal times. It took Ms Paterson years of meticulous planning to pull off the event. She studied ‘every mountain range on earth’ and finally chose the mountains via collecting data using Nasa’s Shuttle Radar Topography Mission. First There Is A Mountain also aims to raise awareness of the country’s eroding coastline, the effects of climate change and the economic, social and environmental benefits we can receive from preserving it. To further protect the environment, all of the sand moulds will be made from fermented plant starch and at the end of the tour they will be composted and sent back and reabsorbed back into the environment. Ms Paterson says the project ‘makes us aware of mountain rocks’ erosion over millennia, rock shifting across Earth over continents’ evolution, forming unique fingerprints of sand across our modern coastline. The artwork invites the public to slow down, to consider the interconnectedness of the world, its immensity conveyed in miniature.